Given unprecedented levels of urbanization and motorization in addition to deteriorating infrastructure in developed countries, cities around the world have been facing the enormous challenge of delivering sustainable forms of infrastructure with fewer resources. The challenges in urban infrastructure investment become even more daunting as manifested by the staggering size of infrastructure funding gap. Therefore, prioritizing projects at the system level based on transparent and evidenced-based decision-making processes has emerged as one of the most promising ways to bridge enormous funding gaps especially for developing countries. To address the current limitations, this paper proposes a scenario-based multi-criteria prioritization framework for urban transportation projects in developing countries and then formulates it. This is done with the efficient use of pre-existing project evaluation information and emergent scenario of various stakeholders’ inputs. The framework is applied to set priorities for nine recent urban transportation projects constructed within a two-year framework in the Tianjin Binhai New Area, China. The results show that the proposed framework could serve as a consistent, robust, and comprehensive infrastructure project prioritization strategy that reconciles diverse perspectives among stakeholders. It also introduces sustainability in urban transportation decision making and links the prioritization process to the transportation planning that precedes it. Liu, Muqing, et al. "Scenario-based Multi-criteria Prioritization Framework for Urban Transportation Projects." American Journal of Civil Engineering and Architecture 3.6 (2015): 193-199. Liu, M. , Balali, V. , Wei, H. , & Peña-Mora, F. A. (2015). 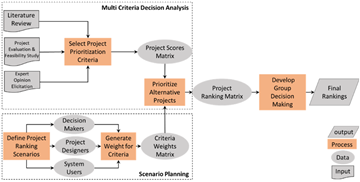 Scenario-based Multi-criteria Prioritization Framework for Urban Transportation Projects. American Journal of Civil Engineering and Architecture, 3(6), 193-199. Liu, Muqing, Vahid Balali, Hsi-Hsien Wei, and Feniosky A. Peña-Mora. 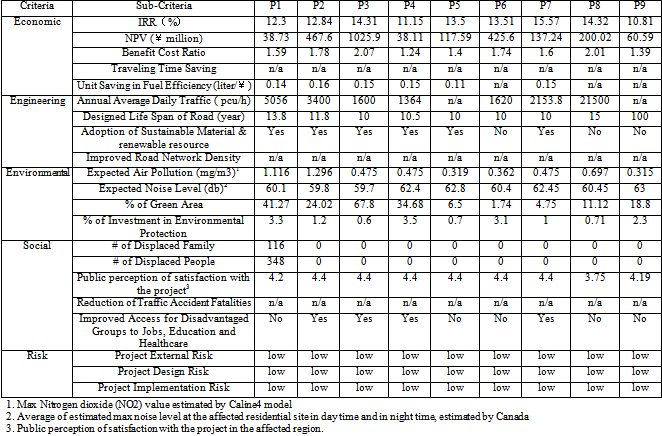 "Scenario-based Multi-criteria Prioritization Framework for Urban Transportation Projects." American Journal of Civil Engineering and Architecture 3, no. 6 (2015): 193-199. Given unprecedented levels of urbanization and motorization and deteriorating infrastructure in developed countries, cities around the world have been facing the enormous challenge of delivering sustainable forms of infrastructure with less resource. It is estimated that the world needs to invest $57 trillion in infrastructure by 2030 to maintain current levels of infrastructure and to support projected levels of economic growth worldwide . $1 trillion per annum over the period by 2020 is required by developing countries to meet the demand of rapid urbanization and to address the backlogs and deficiencies for infrastructure facilities . For United States, the cumulative gap between projected needs and planned expenditures in infrastructure system will total $1.1 trillion by 2020 . Within this context, prioritizing projects at a system level based on transparent and evidenced-based decision making processes has emerged as one of the most promising ways to bridge such enormous funding gaps. Globally $200 billion could be saved through the reduction of infrastructure cost, the insurance of public accountability, and the avoidance of arbitrary decision-making . Volumes have been written on the shortcomings of contemporary metropolitan transportation planning. Effective prioritization of infrastructure projects are hindered by a series of constraints including but not limited to institutionalized inefficiency, inadequate data obstructing decision making, insufficient coordination among various stakeholders, lack of public consultation, lack of technical capacity for project programming, and lack of consideration of possible alternatives in the infrastructure planning . Three types of major shortcomings in urban transportation planning are : (i) transferability of the computerized modeling approach from one geographical location to another; (ii) acceptability of the assumptions underlying transport forecasting outcomes; (iii) subjectivity of the judgment used by transportation planning practitioners. Major challenges of setting priorities for infrastructure development in developing countries can be listed as: (i) lack of a systemic approach to deal with competing objectives among social, economical, and environmental issues; (ii) lack of integration of preferences, attitudes, and organizational values of the involved stakeholders; (iii) lack of public participation, consultation, and monitoring in the urban transport planning process; (iv) lack of consistency of project prioritizing strategies that lead to ad-hoc case-by-case decision-making process; (v) lack of risk management to ensure the potential costs and benefits are equitable allocated [6-8]. This paper therefore proposes a scenario-based multi-criteria framework for prioritizing urban transportation projects to support sustainable urban transportation development through the efficient use of existing project evaluation information and emergent scenario of various stakeholders’ input. In the following, the related work for scenario planning and the application of Multiple-Criteria Decision Analysis (MCDA) in transportation projects prioritization is briefly reviewed. Then, the proposed method and a cased study of Tianjin Binhai New Area in China are presented in detail. In the context of transportation planning, scenarios adhere closely to the consensus definition of “narratives or sets of assumptions that explore plausible trajectories of change” that underpin the different transportation policy and investment options . Thus, scenario planning is a tool designed to help decision makers prepare for the future by making robust strategic decisions, rather than a substitute for traditional business planning tools such as forecasting . Transportation-focused scenario planning is viewed as both an enhancement to the conventional transportation planning process and as a platform to address the shortcomings in traditional approaches by emphasizing public involvement. Federal Highway Administration (FHWA) recommends six key phases for transportation agencies to implement scenario planning including: (i) engaging related partners; (ii) identifying driving force underlying the trends and factors; (iii) establishing objectives based on the study area; (iv) creating alternative scenarios; (v) evaluating scenario impacts; and (vi) determining action plans and monitoring the development of scenarios. Scenario planning focuses on various stakeholders and the general public to understand how variables such as land-use patterns, demographic, congestion, political, economical, and environmental trends impact on transportation network and investments. This is done by comparing scenarios and analyzing their possible outcomes. Scenario planning aims to build a shared future vision that provides a framework for transportation priorities, goals, recommendations, and investments . MCDA is comprised of a suite of methods that comparatively evaluate multiple dimensions of a problem rather than optimizing a single dimensional objective function [10, 11]. The core of MCDA is to model a preference model containing two underlying primary elements: (i) preference in terms of individual criterion for which the relative importance of achieving different levels of performance is measured; (ii) an aggregation model to combine preference across criteria [6, 12, 13]. MCDA is regarded as the most appropriate method for transport project prioritizations since it assesses different alternative options while considering both objective and subjective criteria to produce a common output . A plethora of MCDA tools, techniques, and strategies have been developed to aid decision makers in comparing and prioritizing infrastructure alternative projects . 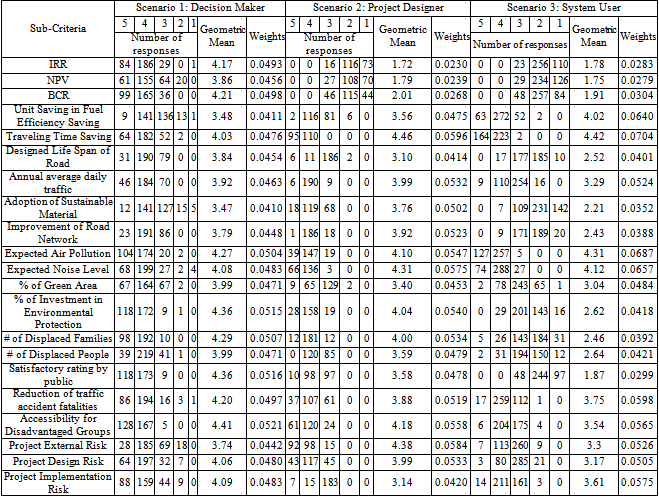 Usage of MCDA for transportation project selection consists of three categories: (i) ranking based approaches (AHP, PROMETHEE, ELECTRE, Impact Index Method, and Goal Achievement Matrix) [4, 16, 17, 18, 19]; (ii) mathematical programming (MAUT, goal programming, dynamic programming); and (iii) heuristic optimization [20, 21, 22]. designed a tool for ranking multinational transport infrastructure investments at a strategic level given suboptimal input data from the European Union countries. Integration of ELECTRE and PROMETHEE methods with the interval approach was used for group decision-making cases to provide complete ranking of bridge construction alternatives considering the risk, uncertainty, and reliability [16, 17]. The Goal Achievement Matrix approach is another common approach for systematic ranking of transportation projects, by assigning normalized scores to each of the project for each criterion [20, 23, 24]. The integration of scenario planning and MCDA has emerged in recent literature as a robust and coherent framework for evaluating strategic options. The combined use of two well-established methodologies provides three major benefits: (i) complementing each other’s strengths; (ii) providing a balanced view of both the analytical and intuitive components of decision making process; (iii) allowing comparisons between different roles of various stakeholders . As summarized in , scenario-informed multi-criteria methods have been applied to energy planning, coastal engineering, infrastructure policy, and climate change in the context of infrastructure management [7, 25, 27, 28]. A scenario-based framework is proposed in this paper based on the MCDA to prioritizing urban transportation projects. It is suitable for the project programming phase in urban transportation planning, and enables prioritization of alternative projects before budget allocation and the development of transportation investment program. Figure 1 illustrates an overview of the proposed method encompassing five major steps as described in the subsequent sections. The first step is selecting project prioritization criteria that reflect the interests of the studied region. The prioritization criteria are decomposed into hierarchy structures. The higher level has general categories and a set of M criterion is defined as at the lower level. The selection of the lower-level criteria is based on three major sources including literature review, project evaluation and feasibility studies, and experts’ opinion. These criteria are used to link the prioritization process to the transportation planning and incorporate indigenous knowledge in urban transport and international best practices [6, 29]. A set of L alternative projects is defined as . The quantity is the normalized value of criterion m in project l and reflects how well the individual project achieves the corresponding criterion. Next step is defining project ranking scenario that represents the preferences and perspectives of the public to weigh on the transportation project decision-making process. As an essential aspect of scenario planning, the use of surveys can help collect, synthesize, and ultimately compare inputs from involved stakeholders . A set of scenario is defined as . The application of scenario planning into project prioritization can systemically incorporate public opinions into the decision making process that engages a variety of diverse stakeholders with different priorities and values on urban transport system. 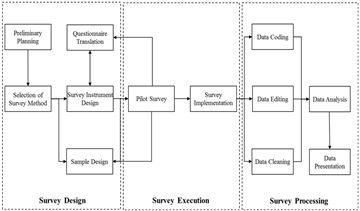 The third step of the proposed method is generating weights through surveys for each criterion selected in step one. A set of M criteria weights in a scenario is defined as with and . The quantity epresents the relative importance of criterion with a larger weight implying higher importance given the stakeholder’s perspectives of project ranking priority in scenario . In this study, the purpose of conducting surveys is to incorporate concerns, attitudes, and opinions from the perspective of transportation system users, project designers, and decision makers alike and develop a balanced and inclusive project prioritization strategy. The survey should follow a well-defined and rigorous framework as opposed to the ad-hoc and piecemeal processes currently prevalent in the developing countries . 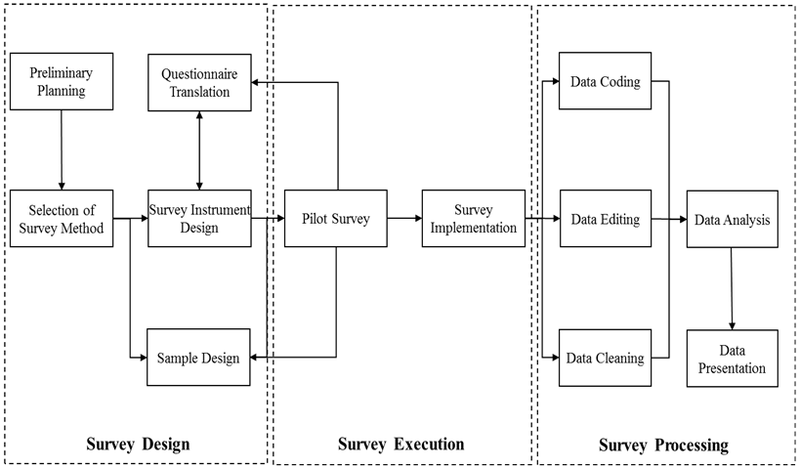 The survey framework as illustrated in Figure 2 follows three main stages, including survey design, survey implementation, and survey processing. The quantity indicates the priority score of project l in scenario n with a greater score implying a higher priority of the project. The final ranking of the proposed framework depends on the difference between and , with the larger difference indicating the higher ranking [16, 31]. The Tianjin Binhai New Area (TBNA) is a national flagship development zone located along the west coast of Bohai Gulf in Northern China. Economical, financial, and administrative reforms are currently being administered under the direct guidance of the Chinese Central Government. The origins of TNBA can be traced to the establishment of the “Tianjin Economic and Technological Development Area”, one of the first batches of pilot cities featuring the opening and reforming policy implemented by the central government in 1984. As explicitly stated in the 11th Five-Year National Development Strategy, TBNA is now regarded as the “third (economic) growth pole” to drive regional and national economic growth [32, 33]. 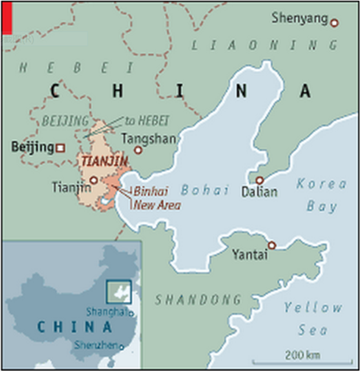 TBNA is bordered by Beijing (140 km) and by downtown Tianjin (40 km) to the northeast. This covers an area of 2,270 km2 with 2.48 million residents, of which 1.16 million are permanent. Beyond its economic relevance, TBNA was chosen as a case study to improve urban transportation project prioritization strategies at the municipal level. Figure 3 illustrates the geographical relationship of TBNA with Tianjin and Beijing. The alternative projects selected in this case study include seven road construction projects, one city bypass extension project, and one bridge expansion project with the construction period from 2009 to 2015. 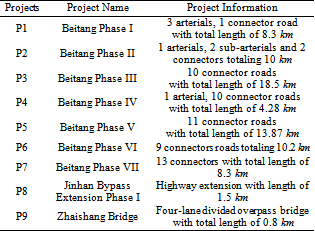 The details of the projects are described in Table 1. Following the proposed framework, the first step is establishing the prioritization criteria and generating a project score. The prioritization criteria are decomposed into two level hierarchy structures. The higher level has five general sustainability categories, consisting of economical, engineering, environmental, social, and risk. There are twenty-two criteria within five categories; they consist of (i) economical criteria: Internal Rate of Return (IRR), Net Present Value (NPV), benefit cost ration, traveling time saving, and unit saving in fuel efficiency; (ii) engineering criteria: annual average daily traffic, designed life span of road, adoption of sustainable material and renewable resource, and the improvement of road network density; (iii) environmental criteria: level of air and noise pollution, percentage of green area in the total project area, and percentage of investment in environmental protection; (iv) social criteria: number of displaced family and individuals, public perception of satisfaction with the project, reduction of traffic accident fatalities, and improved accessibility for socially disadvantaged groups; (v) risk criteria: project external risk, project design risk, and project implementation risks. The selection of the criteria are based on current transportation planning practice in TBNA, requirement of multi-lateral development banks who sponsor similar projects in China , consultation with experts and experienced professionals, and literature review [6, 35, 36]. Table 2 presents the project score matrix, whose data is from the project feasibility reports that were produced by consultants and engineers who were involved in the projects. The three defined decision makers include: (i) elected or appointed officials responsible of making the final decision regarding the urban transport project programming; (ii) project designers who ensure that projects are well-engineered and technically feasible; and (iii) system users who actually use the transportation system. Where N is target population size, M is margin of error (5%), C is the statistic associated with the confidence level (95%), P is the assumed proportion of population (50%), and S is minimum sample size required for desired level of precision. The project ranking matrix is calculated by multiplying the normalized project score matrix by the criteria weight matrix. 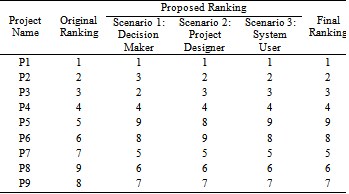 After adopting the group decision making proposed in the step five of the framework, the final ranking is generated in Table 5 to compare with the original rankings assigned to the projects. A scenario-based multi-criteria framework was proposed in this paper to prioritize urban transportation projects within developing countries and was applied to a real world case study in the Tianjin Binhai New Area in China. The five-step method was proposed in a multi-criteria decision analysis environment by incorporating scenario planning and group decision making techniques. The proposed method involved public participation to achieve objectives based on sustainable criteria. The preliminary results of the case study have shown that the proposed framework adequately addresses the concerns of the local community. Therefore, it provides the best alternative for decision makers to take into consideration. The practical contribution of the paper is the creation of a consistent, robust, and comprehensive infrastructure project prioritization strategy that reconciles diverse perspectives among stakeholders while introducing sustainability in urban transportation decision making at the same time and linking the prioritization process to the transportation planning that precedes it. The authors would like to thank Professor Liu Yong from Nankai University and Mr. Zhe Ying from Tianjin Binghai New Area Construction & Investment Group Co., LTD for their invaluable support and inputs. Dobbs, R., Infrastructure productivity: how to save $1 trillion a year. 2013: McKinsey. Moore, R. and S. Kerr, On a highway to help: multilateral development bank financing and support for infrastructure. 2014. Cullen, D., ASCE: Infrastructure-funding gap must be bridged. Fleet Owner, 2013. Ziara, M., et al., Strategic implementation of infrastructure priority projects: case study in Palestine. Journal of infrastructure systems, 2002. 8(1): p. 2-11. Zegras, C., J. Sussman, and C. Conklin, Scenario planning for strategic regional transportation planning. Journal of urban planning and development, 2004. 130(1): p. 2-13. Jones, S., M. Tefe, and S. Appiah-Opoku, Proposed framework for sustainability screening of urban transport projects in developing countries: A case study of Accra, Ghana. Transportation Research Part A: Policy and Practice, 2013. 49: p. 21-34. Karvetski, C.W., J.H. Lambert, and I. Linkov, Emergent conditions and multiple criteria analysis in infrastructure prioritization for developing countries. Journal of Multi-Criteria Decision Analysis, 2009. 16(5-6): p. 125-137. Liu, Z. and G. Smith, China: Building institutions for sustainable urban transport, in Emerging Urban Tranpsort Challenges: A Perspective2006, Eastr Working Paper. FHWA, FHWA Scenario Planning Guidebook, 2011. Jensen, A.V., Appraisal of Transport Projects: Assessing Robustness in Decision Making, 2012, Ph. D afhandling, Institut for Transport, Danmarks Tekniske Universitet. Kalhor, R., H. Akbarshahi, and S.W. Case. Multi-Objective Optimization of Axial Crush Performance of Square Metal–Composite Hybrid Tubes. in ASME 2013 International Mechanical Engineering Congress and Exposition. 2013. American Society of Mechanical Engineers. Belton, V. and T. Stewart, Multiple criteria decision analysis: an integrated approach. 2002: Springer. Schutte, I. and A. Brits, Prioritising transport infrastructure projects: towards a multi-criterion analysis. Southern African Business Review, 2013. 16(3): p. 97-117. Tsamboulas, D.A., A tool for prioritizing multinational transport infrastructure investments. Transport Policy, 2007. 14(1): p. 11-26. Goodman, A.S. and M. Hastak. Infrastructure planning handbook: planning, engineering, and economics. 2006. ASCE. Balali, V., et al., Selection of Appropriate Material, Construction Technique, and Structural System of Bridges by Use of Multi-Criteria Decision-Making Method. Transportation Research Record: Journal of the Transportation Research Board (TRR), 2014(2431): p. 78-87. Balali, V., B. Zahraie, and A. Roozbahani, Integration of ELECTRE III and PROMETHEE II Decision-Making Methods with an Interval Approach: Application in Selection of Appropriate Structural Systems. Journal of Computing in Civil Engineering, 2012. 28(2): p. 297-314. Balali, V., B. Zahraie, and A. Roozbahani, A Comparison of AHP and PROMETHEE Family Decision Making Methods for Selection of Building Structural System. American Journal of Civil Engineering and Architecture, 2014. 2(5): p. 149-159. Tsamboulas, D., G. Yiotis, and K. Panou, Use of multicriteria methods for assessment of transport projects. Journal of Transportation Engineering, 1999. 125(5): p. 407-414. Berechman, J. and R.E. Paaswell, Evaluation, prioritization and selection of transportation investment projects in New York City. Transportation, 2005. 32(3): p. 223-249. Iniestra, J.G. and J.G. Gutiérrez, Multicriteria decisions on interdependent infrastructure transportation projects using an evolutionary-based framework. Applied Soft Computing, 2009. 9(2): p. 512-526. Sinha, K.C. and S. Labi, Transportation decision making: Principles of project evaluation and programming. 2011: John Wiley & Sons. Hill, M., Planning for Multiple Objectives. An Approach to the Evaluation of Transportation Plans, 1973. Won, J., Multicriteria evaluation approaches to urban transportation projects. Urban Studies, 1990. 27(1): p. 119-138. Ram, C., G. Montibeller, and A. Morton, Extending the use of scenario planning and MCDA for the evaluation of strategic options. Journal of the Operational Research Society, 2011. 62(5): p. 817-829. Lambert, J.H., et al., Prioritizing infrastructure investments in Afghanistan with multiagency stakeholders and deep uncertainty of emergent conditions. Journal of Infrastructure Systems, 2011. 18(2): p. 155-166. Karvetski, C.W., et al., Integration of decision analysis and scenario planning for coastal engineering and climate change. Systems, Man and Cybernetics, Part A: Systems and Humans, IEEE Transactions on, 2011. 41(1): p. 63-73. Schroeder, M.J. and J.H. Lambert, Scenario‐based multiple criteria analysis for infrastructure policy impacts and planning. Journal of Risk Research, 2010. 14(2): p. 191-214. Meyer, M.D. and E.J. Miller, Urban transportation planning: a decision-oriented approach. 2001. Richardson, A.J., E.S. Ampt, and A.H. Meyburg, Survey methods for transport planning. 1995: Eucalyptus Press Melbourne. Morais, D.C. and A.T. de Almeida, Group decision making on water resources based on analysis of individual rankings. Omega, 2012. 40(1): p. 42-52. Belle, I., FROM ECONOMIC GROWTH TO SUSTAINABLE REGIONAL DEVELOPMENT? 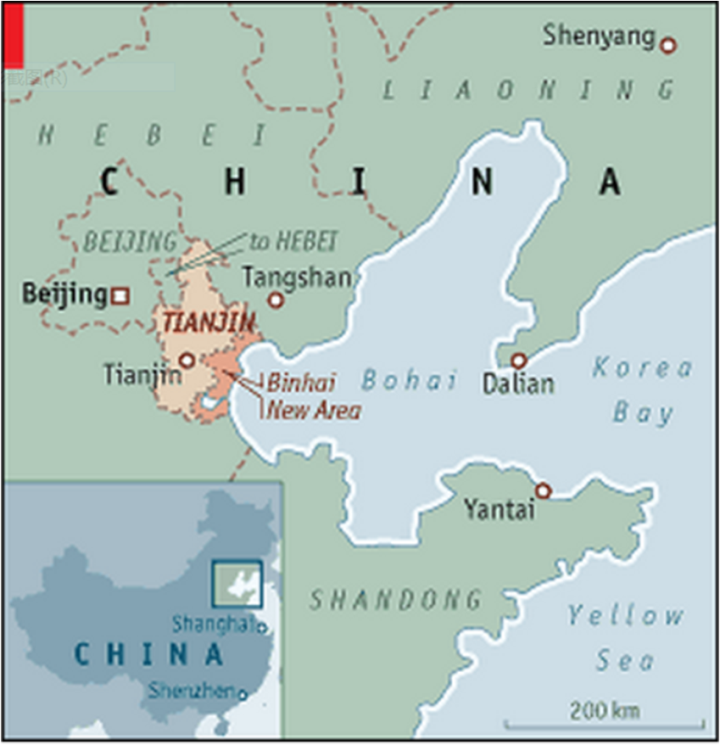 THE CASE OF CHINA'S TIANJIN BINHAI NEW AREA. Regions Magazine, 2011. 282(1): p. 15-18. Zhu, X. and B. Sun, Tianjin Binhai New Area: A Case Study of Multi-Level Streams Model of Chinese Decision-Making. Journal of Chinese Political Science, 2009. 14(2): p. 191-211. Institute, W.B., Integrated Urban Transport Planning, 2011. Mihyeon Jeon, C. and A. Amekudzi, Addressing sustainability in transportation systems: definitions, indicators, and metrics. Journal of Infrastructure Systems, 2005. 11(1): p. 31-50. Litman, T., Sustainable transportation indicators. Victoria Transport Policy Institute, 2003. 100. McIlwee, J.S. and J.G. Robinson, Women in engineering: Gender, power, and workplace culture. 1992: SUNY Press. Neter, J., R.A. Leitch, and S.E. Fienberg, Dollar unit sampling: Multinomial bounds for total overstatement and understatement errors. Accounting Review, 1978: p. 77-93. Dillman, D.A., Mail and Internet surveys: The tailored design method--2007 Update with new Internet, visual, and mixed-mode guide. 2011: John Wiley & Sons.